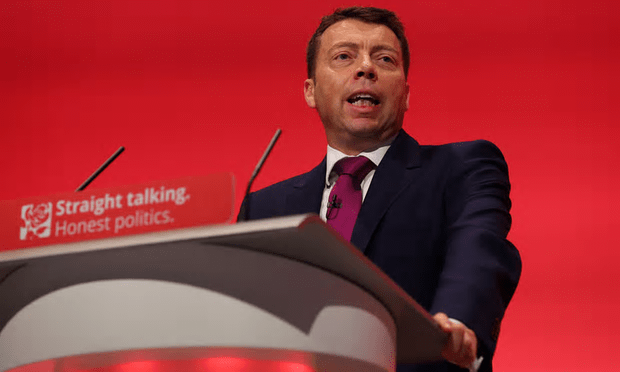 Send your complaints here: Iain McNicol is the general secretary of the Labour Party [Image: Gareth Fuller/PA]. However, there was also a boost for Labour rebels as rules that allowed anyone to vote in the leadership last summer by paying just £3 were ditched. Instead the price has been increased to £25, while full-time members must have been affiliated to the party for at least six months to vote – barring the 100,000 new members who joined in recent weeks. If true, it is as though these people are determined to alienate the party members who pay their wages. The new members – more than 130,000 in the last few weeks alone – joined because they want to support Mr Corbyn; they want to support democracy. A decision to take their money and then disenfranchise them is a slap in the face for everybody who joined in good faith. Meanwhile a £25 supporter can vote within two days of being accepted. Does anyone smell a stitch-up here? If it is true, this is a decision that must be reversed immediately. The leadership election cannot take place while it is in force. Corruption and vote-rigging, pure and simple. They have broken the Labour party rules by making that ruling, and for that, they should be expelled – quickly, so their illegal vote can be reversed. I’ve never liked that people can buy a vote for £3 nor that people can just join and vote immediately. I’ve always thoughtbthat there was a qualifying time, six months, before you can vote. At least I believe that’s how it used to be. Having been a member for well over forty years I’ve seen entryism by both the far left and the far right and also rifts and schisms wither the SDP, militant, pink Tories etc but the behaviour of the PLP over the last ten months beggars belief. Some elements have apparently deliberately put the electoral chances of their fellow members at risk by giving briefings against the leadership at every chance. Also some members of the left have reacted to this by giving them the chance to point the finger at Corbyn as either encouraging these excesses or being “too weak” to stop them as Eagle has done today. Threats and abuse have no place in the Labour Party and I would support the expulsion of any member from either side who is proved to have done this. It’s time to end this fratricidal warfare and unite against the real enemy. Frankly no matter who wins the leadership vote should expect TOTAL loyalty from both the PLP and the wider membership at this crucial time in Britains history when the real right are arming to attack the hard won advances in working conditions etc, the very existence of the NHS, the education opportunities of our children and the pensions and care for our senior citizens. I have joined to support JC but should he lose I will support the new leader provided it has been a FAIR contest on a level playing field! There has been enough bulls**t surrounding this very nasty campaign. If Labour are to be a credible force in British politics, they must put the knives away and have a straight forward decent ballot! Just a thought but if they did make this change to members voting, wouldn’t the Labour Party be in breach of contract? I’m no lawyer but if people signed up with the clear understanding and provision that they could vote and they paid, then surely this change can’t be imposed retrospectively without causing a breach of contract. Just a thought which might be worth following up. This report of the NEC decisions is so unfair that it must be wrong as to some details – surely. Your picture showing Labour pledge of “Straight Talking…Honest Politics” on the podium was a good example of the way it might have been if the right wing forked tongue dishonest politics had not taken over the show with their own brand of ego freaks.. They must be mainly Cons as this is the Cons style of doing business or just out and out lemmings dancing to the black arts of the Con covert operations.. I have had enough of lying Cons and their nasty party but at least you understood their greedy me me me attitudes and making sure they were top dogs and dominate control freaks…..even if the labour deserters won the day, by their head up the backside way of working, most of them are the most lacklustre bunch of no hopers. One could never get behind any of them and they certainly are to devious for most rank and file who put a strong store on loyalty and honesty…despite what the deserters think they know that is what loyal supporters look for out of their leaders and MPs. Yep, I definitely smell a rat all right. A very large rat! Of course, this also means that however many members joined very recently to vote AGAINST Corbyn……..
Interestingly, I have already come across some tweets, which are suggesting a workaround by voting through a union instead? I have joined The Labour Party today. FI cannot vote in the Leadership Election I will be stopping my yearly subscription tomorrow. I cannot believe people within the NEC can justify implementing this rule and still want to attract supporters. After the Backstabbing of the past 2-3 weeks, my belief that MP’s are only into Politics so they can “Line Their Own Pockets” seems to be true. No wonder so many of us have lost interest in Politics. Moving the goalposts! Scabby decision. I’m not sure it’s that Bad Mike – though I was initially shocked by it. All the members who voted in the first election can vote. Members who joined in the post-Corbyn victory surge up to the end of January can vote (as long as they pay their renewal in time). I can tell you as a Branch Membership Secretary that the surge had almost completely dried up by the end of January and didn’t kick off again until after the BREXIT vote. We DO need clarification on the registered supporters issue – it cannot be right to allow supporters a vote while denying it to supporters who have transferred after the freeze date. In addition, the NEC have taken away a black propaganda tool from the Eagle campaign. Corbyn’s majority among the membership is intact and a successful outcome to the Membership Section of the NEC ballot next week will ensure that the new rules are applied fairly. I do agree that new members since January have the right to feel frustrated and aggrieved – but they seem to be a hardy lot! – The many new members who turned up to Branch Meetings in my Constituency over the last couple of weeks to support Jeremy only to be told by branch officers that they couldn’t vote on the motion – but who, despite that, stayed, participated in civilised debate to the extent they were allowed are an inspiration – and just by being there I am convinced they influenced the outcomes. I am disappointed as this didn’t happen nine months ago when there was a surge of right wing people joining the Labour Party to undermine Jeremy Corbins leadership by voting for him, I will be prepared to pay the £25 as a new member as I strongly believe in my right to vote, but I strongly disagree with the decision. I quit Labour Party membership after the war criminal began his bloody, murderous rampage. It’s very tempting to rejoin now to help shut down the pink tories but this embargo casts doubt on matters. Another reason is the unchallenged mainstream media narrative peddled by the establishment’s sycophant ‘news’ anchors which shows they are petrified of a principled JC and have been in maximum overdrive, desperately trying to stir the vitriol of the ‘aspirational’ zombies and direct it against him. What on earth is going on here now? It looks to me as though the Party has been infiltrated with people who want to destroy it! If Jeremy Corbyn had not been accepted on the ballot paper, I would have immediately withdrawn my support of the Party and, furthermore, I shall only remain a member until he is elected and disallows this disgraceful event of robbing the party of new members by making this exorbitant and unjustified charge. The Tories must be laughing their heads off and I can’t blame them. Don’t forget to vote in the NEC elections! That has been stopped. Affiliate membership stopped from voting unless members before 12 January. I tried to get a vote via my Unite membership the last time and was rejected. The reason is that I am a member of another political party, the SNP. That party is not represented south of the border so the actions of Labour in Westminster affect me just as much as anyone in England, Wales or N Ireland. I can see the reasoning behind the rejection, obviously aimed to stop folk “supporting” Labour and voting in a way that would be to their own partiy’s advantage. The main reason I don’t vote Labour is because of the PLP’s policies over the last few parliaments . I have paid my political levy all my working life, would like to have my say in voting for a leader that could take the party back to why I paid it , so I was pretty pissed off. Jeremy Corbyn should defect to the green party and work with Caroline Lucas, I would vote for them, I joined a week or so ago to keep Jeremy as leader. We can follow him elsewhere! Bring it on! We need to keep the Labour Party membership, funding and party apparatus. I’m something of an environmentalist but I’m not a fan of the Green party, I’m sorry so, I’ll not be voting for them, nor will I be joining them. Never thought I’d love to see the day that the labour party imposed a poll tax on its own members. This is blatant voter suppression. How is it OK to disenfranchise hundreds of thousands of new labour members and introduce charges to put voting out of the reach of many poor working class voters? This is disgusting. Can I even become a registered voter without leaving the labour party? Or do I have to leave? And I’m also reading that there’s only TWO DAYS in which to sign up. Who knows when that will be?! Probably the second a big news story comes out so it flies under the radar. When new members joined, the website promised we’d get a vote in the leadership election, in fact, it still does! Price to become a registered supporter is still listed as 3 quid too, but the sign up button isn’t working at the moment. I’m guessing they’re putting a freeze on registered supporters until they’ve put the prices up. Seems crazy to incentivise people to leave the labour party, but some reports suggest 80% of the new members are Corbyn supporters, so it’s no surprise that they want us gone. Which is why why MUST hold firm, and hope this can be challenged before the election. If that’s true, then there is a clear breach of contract and I’m sure that a legal challenge could be mounted. Take screenshots with the date, if you can, as evidence of “advertising.” This is, indeed, disgraceful behaviour, undmocratic and a poll tax, in all but name. £abour party, or a scam? Shame! I’ve seen suggestions on Twitter that joining unite community (£2 a month) would allow us to have our say for free. I think we need to challenge this legally, even Angela eagle has been trying to get people to join, citing them voting against Jeremy Corbyn, but because it looks as if most of the new members want Corbyn the NEC rewrites the rules to disenfranchise them, and HOW did we go from £3 – £25 in 12 months. First the leaking to the press, the critical articles, then the resignations, then the threats of a challenge, then the challenge, (but onlty to test the waters of keeping Jeremy of the ballot) and now this. The machinations of these people are an embarrassment, people are laughing at them and the Labour Party. It is disappointing. I have Tory friends who have been joining recently at £3 to vote for Corbyn. I joined last year so I will be voting for Corbyn. Good – keep it up. I strongly urge your Tory friends to pay their £25. They’ll be rooted out, like last year, but we’ll keep the money. This is the Right Wingers way of attracting more votes to their candidate/s because they believe Corbyn supporters will not be able to pay. This begs the question “how different are the Tories who buy their vote from the wealthier and people who benefit from their policies and the Right Wing Tory Lites who buy their vote from the wealthier and people who benefit from their policies?” The answer, is of course, – no different. So now Labour’s National Executive Committee AND majority of the Parliamentary Labour Party are antidemocratic, Mike? Surely you can see that there must be something really wrong with Corbyn for all these things to be happening – things that never even happened when a rotter like Tony Blair led the party? Do you really ever see a time when a Labour government led by Jeremy Corbyn, with Dianne Abbot as Secretary of State for Health, and a working majority will be elected to office? Really, Mike? Do you honesty really believe that such a thing could happen? No, I see that there must be something really right about Jeremy Corbyn, for all these rotten apples to be shaking themselves out of the tree. I honestly believe we’ll see a Labour government sooner if Corbyn stays in as leader and enacts the reforms he has planned. The other conditions you mention are all variable. Dianne Abbot in charge of the NHS? That is never going to happen – never in a million years. Seriously. What would you like me to say to that? You’re entitled to your opinion, but that’s all it is. You don’t know what will happen, any better than the rest of us. What is happening is disgusting and undemocratic. If we, the people, want Mr. Corbyn, then we should be allowed to have him. If only the M.P.s would support him, instead of undermining him at every opportunity, we might have an effective opposition. Our M.P.s are supposed to represent us, not themselves! If those people cared about the party, really cared, why choose such an inopportune moment? Why go so public with their criticisms and denouncements? The evidence say that they are doing their level best to destroy the party. Depending on your employment status… there are a couple of options. One way would be to join unite, have your vote, and then leave unite which would be between about 3 and 6 quid in total as the monthly membership is around 3 quid. Obviously Unite would prefer you remain a member and there are/maybe advantages in remaining. A slight issue might be that people who have signed up as members, might be excluded from voting as supporters (and possibly via union affiliated). They are definitely excluded from being members and voting as supporters if they joined up using the pensioners option (see Paul mason twitter) but also excluded from voting as members because of the cut off date. To be honest, its disgusting gerrymandering and reprehensible that they are pricing out the very people who need a left Labour from democratically voting. This was announced llate yesterday evening, with the news that Corbyn was to be on the ballot. So we’re only allowed a few seconds of cheering, before they are again at their skullduggery. Then Angela Eagle was soon afterwards on Newsnight asking people to pay £25 in order to vote out Corbyn. An amount that poor people cannot easily find just like that, but easy to find for those wanting to vanquish Corbyn and his policies for a fairer society. This from those complaining about people who aren’t really Labour supporters inflitrating the party (as usual, with no real evidence). There are no limits to the depths to their dupliciity it seems. Anyone wondering about supporting Corbyn, take note of the dishonesty of their challengers, and their open contempt for the Labour membership and for democracy. Anyone out of work can vote for £2 through Unite. Join their community by monthly direct debit, opt in to the political levy and you can vote as an affiliate. The rate for employees varies by income. Best of all, the closingdate is 8 August do thrre’s plenty of time. The link is here: https://www.unitetheunion.org/campaigning/unitepolitics/your-party-your-voice/ Can you spread the word Mike? Thanks to Joyce Sanders, Belper & Duffield branch for the tip. This is all getting a bit confusing. Most of the media make it sound as if none of the £3 supporters after January will get a vote, under any circumstances, while new members paying £25 over the next couple of days will. Reading the BBC’s take (OK, I know), it sounds as if those members will be allowed to vote if they fork out the £25 in the same time frame. No way to treat a membership,a disgusting ploy by the NEC but surmountable, if costly. I think Jeremy Corbyn needs to elect a new party for himself and for that party to elect a new electorate for itself. On this site, at least, I think you’re outvoted. That’s democracy for you. And at least I get to differ in my opinion as far as the majority on this site goes, which is fair and necessary for democracy to work. Different views, freedom to express them and choice amongst other to support them or otherwise makes for democracy. And sadly, in my opinion, Corbyn is dooming Labour to perpetual opposition and even threatening the existence of the party as a political force. I would love to be wrong about this but don’t believe that I am. My suggestion would be for Corbyn to remain leader for another couple of year and then, if the polls seem to indicate that he is making no progress, that he step down and let somebody else lead Labour into the 2020 general election. I would say that the members of the PLP ‘coup’ are endangering the Labour Party. They do not represent Labour Party values, therefore they should go – either make way for people who hold the same values as the majority, or leave politics altogether. Your suggestion would be fine, though – as long as the polls to which you refer are actual elections, and not the findings of the paid polling companies who produce results according to the desires of the people who pay them.